Compact, customized and seriously loud! Comes in nine bright colors! 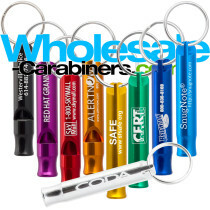 Our custom engraved safety whistles are available in multiple colors, provide exceptional value with wholesale whistle pricing, and feature a sleek, rugged and bright anodized aluminum finish. Second location engraving just .10 per. 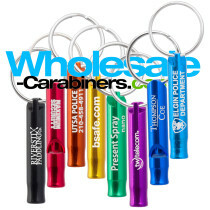 Great to promote your company name on one side of your whistle keychain, and for advertising your Web address on the other. 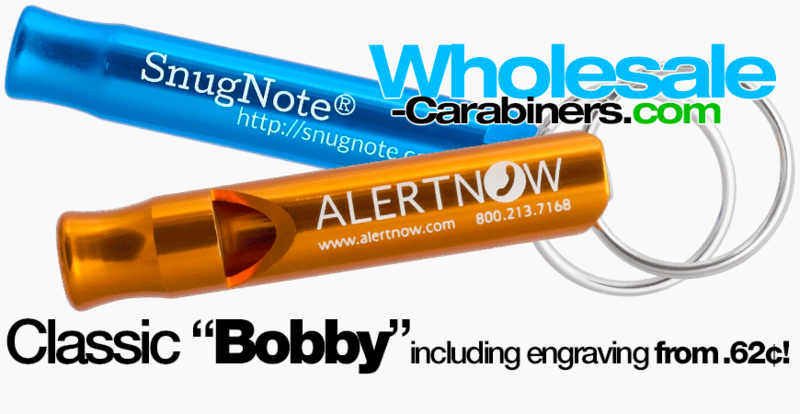 U.S. lab certified lead-free — our safety whistles are 1st quality — they are 100% series-6000 anodized aluminum, providing a safe, tough, rich bright color and finish, and they are permanently and crisply YAG Laser engraved at no extra charge, as opposed to silk screened which is prone to flaking. 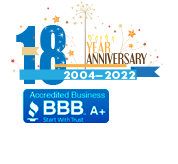 Wholesale-carabiners.com — trusted for quality, value and service.